Modern music with a pan-African basis! Does this mean anything at all? Well, Michael is known as an innovative drummer/composer, incorporating African concepts into his music. Mixing electronics with audio and some words, this is highly personal music – nine different rhythmic pieces, nine different moods. Is it lounge, trance, jazz, voodoo, hypno, pop? With Kofi Ayivor (GHA), Ousmane Seye (SEN), Jeroen van Vliet (NL), Konkie Halmeyer (CUR), Cherry Wijdenbosch (SUR), Jasper le Clercq (NL), Nusch (NL). The Ritmoloog continues..... Total time: 63'29". 20 page booklet. Tracklist: 1. Gongoma Méditatif, 2. Fwanda Fun, 3. Rain Music, 4. Download And Merge, 5. Kalimba Nine, 6. Xylo Xyzo, 7. Sophie's Jumpsuit, 8. Heritage Groove, 9. La Bouche. 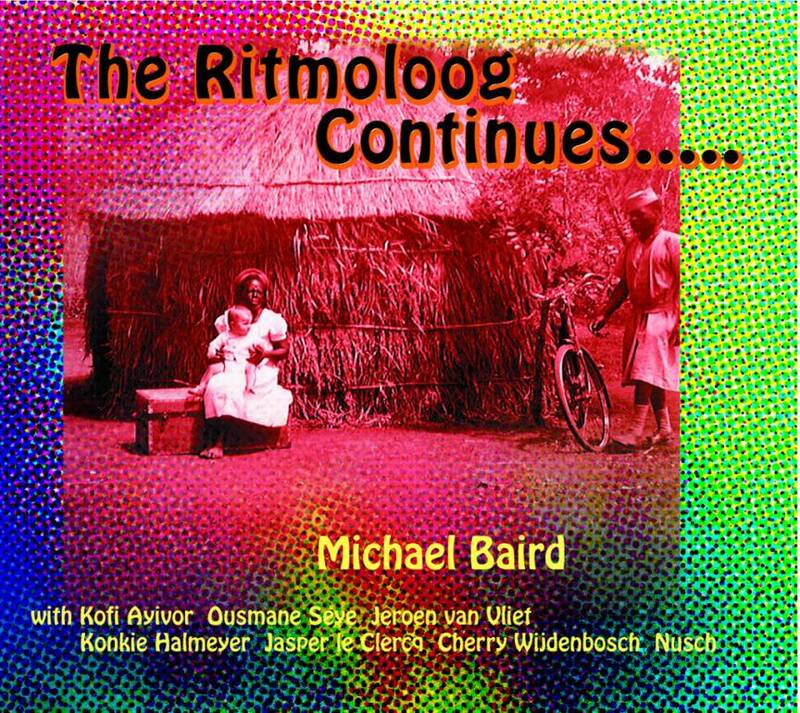 Jazzism 2006 (NL): "Michael Baird’s fascinatie voor de vele Afrikaanse muziektradities ligt aan de basis voor deze opvallende cd met vaak hypnotiserende, complexe ritmes. Vrijwel alle stukken bevatten plagerige ‘hooks’ die dan, als je niet oppast, dagen door je hoofd blijven zwerven. Muziek van een ontwapenende eigenzinnigheid." "Michael Baird’s fascination for the many African music traditions forms the basis for this outstanding cd with often hypnotic, complex rhythms. Almost all the pieces contain teasing ‘hooks’ which, if you’re not careful, continue to wander around your head for days. Music that is disarmingly idiosyncratic."